A week after about 179 people were killed in deadly floods in the western part of Japan in July, the country experienced the hottest days in 5 years. Across Europe, the summer heat continues, with parts at risk of drought conditions. Dry soils and vegetation have led to devastating wildfires, even in areas close to the Arctic. And while below-normal rainfall has been predicted from June through August, the thunderstorms that will occur are likely to be severe, resulting in flash flooding and damaging winds – as was the case in the south of France, which was recently hit by severe flooding. There is a general agreement of an ongoing change in the climate, bringing with it much uncertainty of the impacts. We can expect continued heatwaves and flooding in parts of Europe, increasing hurricanes in the Caribbean and intense rainfall in parts of Asia. The unrelenting news about heatwaves, rainfall, and so forth, directs my thoughts to my vegetables, fruits and plants at home. Knowing what climatic condition to expect in the coming days is valuable information that help me better plan and prepare myself to safeguard my vegetables, fruits and plants. While my garden is just a small piece of a larger picture, facing such uncertainty, the way we respond to the changing climate can have socio-economic benefits, and save the lives of many. So, how can we be well prepared for climatic variability? Is there a way to reduce the impacts of extreme events such as flooding and drought? Accessing the necessary information is a part of the planning process, while interpreting the information for decision making and planning is the other part. A way to bring these parts together is through the Flood and Drought Portal, which is a key output of the Flood and Drought Management Tools project. The web-based portal has a number of applications that aim to support planning and decision-making for issues related to climate variability and change. The technical applications can be used individually or together, providing users with a scientific approach for identifying and evaluating the risk and impacts for flood and drought events, as well the mitigation or adaptation measures. Access to accurate data and information has been identified as limited and as a challenge for many stakeholders. The data and information application in the portal was developed to accommodate this basic need, providing stakeholders with access to various types of information for basins, including climate information (e.g. rainfall, temperature), vegetation cover, soil moisture, flood and drought indices, and socio-economic data. The amount of data provided by the tool is extensive and provides good insights by offering historical and forecasted data. For example, it is possible to visualise rainfall data for the last 15 years while also projecting both short- and long-term rainfall probabilities. With this information, it is possible to design and plan drought or flood prevention plans or crop irrigation plans. Through this application users have the opportunity to select and use the parameters that best fit their interests. Another feature of the application is the possibility to analyse the data and not only visualise it in maps, but also in charts and tables. 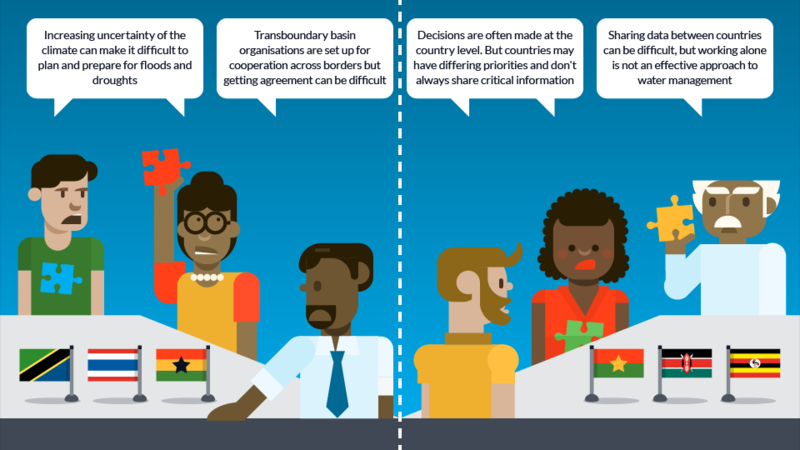 For transboundary basins, access to the same information is essential for good cooperation, understanding, and achieving mutual interests. The data and information application provides stakeholders with the needed information to formulate and update management plans, and assess and evaluate basin conditions. The Data and Information tool has information on each data type available on the web portal, and there is an accessible user manual providing guidance on the functionality of the application. The application provides users with a free source of data of near real-time, forecasting and climate predictions for any transboundary basin. Much like when I look at the weather forecast for the coming days to inform my weekend gardening activities, through the proper use of the information presented by the data and information application, better planning and management of flood and drought impacts is achievable and on a more substantial scale. The Data and Information application is available for all registered users through the Flood and Drought Portal: http://www.flooddroughtmonitor.com. The Flood and Drought Management Tools (FDMT) project is funded by the Global Environment Facility (GEF), International Waters (IW) and implemented by UN Environment, with the International Water Association (IWA) and DHI as the executing agencies. The project developed a package of web-based technical applications (tools), accessible through the Flood and Drought Portal (www.flooddroughtmonitor.com). The tools can be applied individually or together to include information about floods, droughts and future scenarios into planning from the transboundary basin to water utility level. The project is being implemented from 2014-2018 in Volta, Lake Victoria and Chao Phraya as the pilot basins. A transboundary basin is a basin that crosses at least one political border, either a border within a nation or an international boundary. Raul is a graduate from the Wageningen University and Research Centre (WUR), where he did his MSc in International Land and Water Management. Raul also has a background in international development studies, anthropology and sociology. Raul joined IWA as an intern for the Basins of the Future programme, pushing forward IWA’s efforts around the food-water-energy nexus through the ‘Nexus Dialogue on Water Infrastructure Solutions’. In his current position as Programmes Officer, Raul continues to contribute to the water sector under the portfolio of the Basins of the Future Programme, working on a number of projects dealing with climate change resilience and basin management. The water you already have is the cheapest and most abundant resource!